I think this is my first tutorial of the year?! Clearly took longer to recover from the 52 week challenge than I thought. Well, this isn't strictly speaking a mini tutorial but I love it none the less, and hope it takes your fancy too! 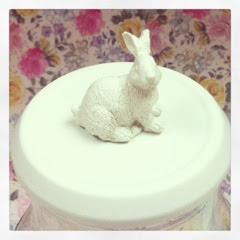 It occurred to me when I set up the free mini bunny offer over on the website that not every doll's house will have a place fitting for a tiny four legged friend so an alternative use was in order. I spotted the idea over on Pinterest and immediately thought of the bunnies, so here we go! Make sure your jar and lid are totally clean and dry, left over stir fry sauce will ruin the look some what! 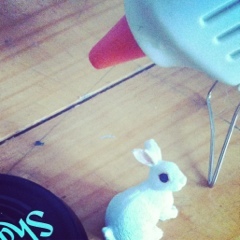 Glue the bunny into the middle of the lid, clean any ooze at the base away quickly as it will show up when you paint it later. 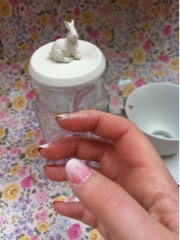 Go to a well ventilated area, preferably outside, and spray the entire lid and bunny allover, thin and even is best, allow to dry then give another coat if required. 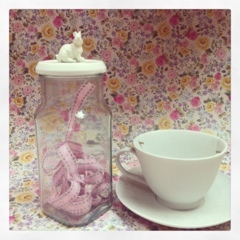 Finally, adorn you jar with it's crowning glory and fill with something pretty. I sense there will be a few more of these in my future, LOVE! Stuff & things: Mums mini's !